How is the day determined? We believe the day starts at sunset and ends at the following sunset. Our first example to be cited is from the book of Leviticus which tells us that the Day of Atonement is on the tenth day of the seventh month. "Also on the tenth day of this seventh month there shall be a day of atonement" (Leviticus 23:27). In Leviticus 23:32 we are told the beginning and the end of the time to observe this day. "It shall be unto you a Sabbath of rest, and you shall afflict your soul: in the ninth day of the month at even [the previous evening at sunset], from even [the previous evening of the ninth day at sunset] unto even [the evening at sunset of the tenth day of the seventh], shall you celebrate your Sabbath" (Leviticus 23:32). From the sunset of the ninth day of the seventh month until the sunset of the tenth day of the seventh month is when this day is to be observed, and all the days of the lunar-solar calendar are to be observed in this manner; from sunset to sunset. The yearly feast days were referred to as High Sabbaths. "The Jews therefore, because it was the preparation ['And it was the preparation of the passover, and about the sixth hour' (John 19:14). It was not the preparation day for the weekly sabbath. ], that the bodies should not remain upon the cross on the sabbath day, (for that sabbath day was an high day,) besought Pilate that their legs might be broken, and they might be taken away" (John 19:31, emphasis added). Our second example to be cited is from the book of Genesis; the story of the creation of this earth, so that it could be inhabited, is given. Let us look at Genesis 1:5 and see what is said there. "And Elohim called the light Day, and the darkness He called Night. And the evening and the morning were the first day" (Genesis 1:5). "And the evening" at sunset with "the darkness called Night" was followed by "the morning" at sunrise with "the light called Day." The Night comes first beginning at sunset and then follows the Day at sunrise with the light. This is repeated for each day of the Creation week. Please see the Hours of the Sabbath by clicking on the shaded area for an depth study on what the Bible has to say about this subject. Our third example is found in the Gospel of John chapter 20. Here we can see the darkness preceded the light and both periods are referred to as "the first day of the week." "The first day of the week cometh Mary Magadalene early, when it is yet dark [before sunrise], unto the sepulchre, and seeth the stone taken away from the sepulchre" (John 20:1, emphasis added). "Then the same day at evening [before sunset], being [still] the first day of the week, when the doors were shut where the disciples were assembled for fear of the Jews, came Yahushua" (John 20:19, emphasis added). It was the first day of the week while it was still dark, and it was still the first day of the week before sunset that evening. The night preceded the day! The first day of the week began at sunset and ended at sunset the following evening. Our fourth example is found in the book of Nehemiah. In this book Nehemiah gives a command that the doors to the city of Jerusalem are to be closed at a certain time before the sabbath begins. "When it came to pass, that when the gates of Jerusalem began to be dark before the sabbath, I commanded that the gates should be shut, and charged that they should not be opened till after the sabbath" (Nehemiah 13:19). If the sabbath does not begin until sunrise as some contend then it would begin to be light before the sabbath and not to be dark as it tells us in the book of Nehemiah! At sunset in the evening when the gates "began to be dark" was when the sabbath was going to begin. Our fifth example is found in the books of Leviticus and Exodus. In the book of Leviticus we are told that "In the fifteenth day of the first month is the feast of unleavened bread unto Yahuwah: seven days you must eat unleavened bread" (Leviticus 23:6). In the book of Exodus we are told "In the first month, on the fourteenth day of the month at even [sunset], you shall eat unleavened bread, until the one and twentieth day of the month at even [sunset]" (Exodus 12:18). Even though the Feast of Unleavened Bread did not begin until the fifteenth day of the first month as we are told in Leviticus 23:6, you were not to eat leavened bread from the evening [sunset] of the fourteenth day of the first month. There are many that contend that the Biblical day does not begin until sunrise. If that is so, then why does the fifteenth day as shown in Exodus 12:18 begin "on the fourteenth day of the month at even?" and the seven days end on "the one and twentieth day of the month at even"? Just as the Day of Atonement began at sunset of the 9th of the month preceding the 10th day of the month, so does the feast of unleavened bread begins at sunset on the 14th day of the month preceding the 15th day of the month. From all five portions of Scripture we can see that the night, which begins at sunset, precedes the light, which begins at sunrise, and both portions make up one single day. "What therefore Elohim hath joined together, let no man put asunder" (Mark 10:9). While Yahushua is speaking specifically about marriage in this verse, the principle remains true in all instances where He joins two objects together. He joined the Night and the Day to make up one Biblical day. The single day and what we would call the 24 hours of the solar calendar was in Biblical times composed of the night which was divided into four periods called "watches" and 12 hours of daylight which were determined by the sundial. Some will still argue that Yahushua said there are twelve hours in the day (John 11:9), but it is clear from the evidence seen in these five portions of Scripture that the Biblical day began at sunset and ended at the following sunset. Yahushua was referring to the time in which He was allotted to work for the Jews before He would be crucified and not what many contend to be a Biblical day. Please go to the link we furnished you earlier which discusses the Hours of the Sabbath in greater depth. Clearly the Devil is deceiving the whole world (Revelation 12:9) and even those who are beginning to understand about the lunar - solar calendar! The Devil will do anything to discredit Elohim's truth by attaching error with Biblical truth. How is the month determined? To begin with, let me tell you there are at least four lines of thought that I know of on how individuals are determining when the month begins. There is not an abundance of Scripture pertaining to this matter to help us. I am going to share with you what we practice based on what my wife and I have observed, prayed about, and found in the Scriptures. There is a lack of Scripture to sustain any of these four positions, including the one I am going to be sharing with you. My wife and I have followed what you are about to read for just over seven (April 2019) years. We have fine-tuned a part of it during that time. I have hesitated to share this before now because I do not want to promote any error so we have been cautious in presenting our position on this matter. The one verse of Scripture used to sustain, not only our position, but others use it as well to sustain their posiiton, is Psalm 81:3. "Blow up the trumpet [These were to be the two silver trumpets described in Numbers 10:2, 10.] in the new moon, in the time appointed on our solemn feast day" (Psam 81:3 KJV). The problem is not apparent in the KJV but in two other translations, we see differences which are used to support two separate opinions. "Blow the trumpet at the New Moon, at the full moon, on our feast day" (Amplified Version) When using this translation we find evidence the new moon is when the moon is full. When another translation is used, we read the following: "Sound the ram's horn [Incorrect - should be two silver trumpets (Numbers 10:2,10).] at the New Moon, and when the moon is full, on the day of our Feast" (Psalm 81:3 NIV, emphasis added). This translation indicates that the New Moon and the full moon are two separate occurrences, but not necessarily. This is the problem I find with this translation. The ram's horn was not to be blown according to what we find written in Numbers 10:10 on the full moon. It appears the Jews were not following the instructions given them in Numbers 10:10 where they were to be blowing the two silver trumpets on the New Moon and were instead blowing the shofar (Strongs #7782). The translation of this verse in this version also concludes by saying "on the day of our feast " which indicates this is talking about a singular day and not two separate days. We find nothing to support the different views from what we read in Psalm 81:3 except that the full moon is possibly the new moon according to the Amplified Version and others. In the Gospel of Matthew, we read the following: "Now from the sixth hour there was darkness over all the land unto the ninth hour" (Matthew 27:45). This darkness had been foretold by the prophet Amos. "And it shall come to pass in that day, saith Yahuwah Elohim, that I will cause the sun to go down at noon [the sixth hour on the sundial], and I will darken the earth in the clear day" (Amos 8:9). How did Elohim darken the day on which Yahushua died? And for three hours? By a solar eclipse? A solar eclipse can only occur during the conjunction phase of the moon. It lasted for three hours because Elohim has the ability to make the sun and moon stand still just as He did during the Old Testament times. “And spake Joshua to Yahuwah in the day when Yahuwah delivered up the Amorites before the children of Israel, and he said in the sight of Israel, Sun, stand thou still upon Gibeon; and thou, Moon, in the valley of Ajalon. And the sun stood still, and the moon stayed, until the people had avenged themselves upon their enemies . . . So the sun stood still in the midst of heaven, [and the moon stood still also] and hasted not to go down about a whole day. And there was no day like that before it or after it [until the day when Yahushua was crucified], that Yahuwah hearkened unto the voice of a man: for Yahuwah fought for Israel” (Joshua 10:12-14). At the time of the crucifixion the sun and moon were stayed until Yahushua had defeated Satan. “And I will put enmity between thee (Satan) and the woman (Elohim’s people), and between thy (Satan’s) seed and her (Elohim’s people) seed; it (the crucifixion of Messiah) shall bruise thy (Satan’s) head, and thou (Satan) shall bruise His (Messiah’s) heel” (Genesis 3:15). One was a deadly wound and the other was a temporary wound. "To this account, Philopon suggested that a Roman account of the eclipse also existed, as he added: 'this is shown by the historical account itself of Tiberius Caesar.' Thus, we find two other possible sources, outside of Christian writings, verifying the occurrence of a solar eclipse, during the crucifixion of Jesus. "What may cause a problem for the Christian text is the fact that a total solar eclipse cannot occur during a full moon, which would have been the case, if Jesus were crucified during Passover; as the text states: 'When Pilate therefore heard that saying, he brought Jesus forth, and sat down in the judgment seat ... And it was the preparation of the Passover.' John 19:13-14 Therefore a paradox arises with the text, when a full moon occurs simultaneously with a total eclipse of the sun, which is impossible. However, one solution to this paradox may now be found in the writing of the Dead Sea Scrolls. "James C. Vanderakam, the John A. O'Brien Professor of Hebrew Scriptures at the University of Notre Dame, has written extensively about the Dead Sea Scrolls community. Set up aproximately 20 years prior to the birth of Jesus, the Qumran community split off from the mainstream population of Judea, because the community believed that the religious system at the time had become corrupted. One crucial conviction of Qumran, was that the religious system had corrupted the calendar, thereby corrupting all of the Jewish Sabbaths and Holy days. "In Vanderkam's article, Calendrical Texts and the Origins of the Dead Sea Scroll Community, he reveals the the Qumran community followed a Jewish calendar, which is different than the calendar that Jews use today. More crucial to the paradox, he reveals that the Qumran community taught that the Full Moon began the month, which would mean that Passover, which occurs mid-month, would have occurred when the moon was dark [conjunction]. Thus, if Passover was celebrated within Ancient Judaism at the dark of the moon, rather than at the full moon, then it would be very possible for a total solar eclipse to occur, simultaneously to Passover and the Crucifixion of Jesus. "Note: Hillel II, the last president of the Sanhedrin, established the modern Jewish calendar, approximately 350 years after Jesus. Other arguments have been made as to why the Jewish calendar may be corrupted as well." [i] Philopon, De Opif, Mundi, 1, 21. But just believing or accepting that the full moon is the new moon by which the month begins does not resolve the issue. When the moon is full, there are three nights in which the moon appears to be full. How do we determine which one is the correct one? Do we use the astrological data from NASA to aid us in this? By using their data we can find the precise time that the moon is at its fullest lunation. I have only one objection with using this method; the people living in Biblical times were not privileged to have this information available to them. They had to rely on observation by the naked eye. I challenge anyone to pick from the three seperate moons occurring on three successive nights at the time of the full moon as to which one is full without using NASA's data. This is what we follow in determining the New Moon, which we believe is the full moon. When the sunsets on the western horizon and is followed by the moon rising above the eastern horizon is how we determine when the moon is full. This can be discerned wherever one has a view of the western and the eastern horizons. Even though it does not always agree with the day that the data from NASA tells us is when the moon has reached its fullness, it is the only way, as far as what we have been able to observe, that is a consistent method of determining when it is full when going by observation only. As the time when the full moon/new moon approaches, the moon waxes fuller each night and each night at sunset it is closer to the eastern horizen, thus giving advance notice that the new moon day is approaching. Another reason for considering the full moon being the New Moon is what is written in Genesis 1:16, 18: “And Elohim made two great lights; the greater light to rule the day, and the lesser light to rule the night . . . And to rule over the day and over the night, and to divide the light from the darkness.” One would think that as important a day as the New Moon day is, that the phase of the moon would be somewhat dramatic and not subtle or not even visible. When the moon is full it rules “the night” unlike when it is in the first visible crescent or in conjunction. The moon in its full moon phase and rising after the sun has set is in the firmament throughout the entire night. It truly rules “the night." Whereas when you observe the first visible crescent as the signal for the new moon, it is only in the firmament for a very short period of time. When the conjunction is used in determining the new moon, the moon may not be in the firmament at all during the night and cannot be observed. Even though NASA uses the conjunction for designating the new moon, I do not believe it can be supported Biblically. One other issue with observing the first visible crescent is that throughout the earth the New Moon Day is observed on two separate days depending on your location, which unlike when the full moon is used as the new moon, it is full throughout the earth on the same evening meaning everyone is in sync with everyone else throughout the earth. And just how does one "observe" the moon when it is in conjunction? You cannot and do not observe it. And now to add to all that i have previously stated about the full moon being the new moon I want to add this which is probably the most conclusive argument. This is something that I have just recently come to realize and so I am adding it to the argument previously given showing that the full moon is the new moon. When “Elohim said, Let there be lights in the firmament of the heaven to divide the day from night” He “made two great lights; the greater light [the sun] to rule the day, and the lesser light [the moon] to rule the night” (Genesis 1:14, 16, emphasis added). He “made two great lights;” He did not make just one light. We see only one light in the sky at the present time, but this was not the way it was in the beginning and will not be the way it will be when Elohim recreates the heavens and the earth. “For, behold, I create a new heavens and a new earth” (Isaiah 65:17). At the present time the moon is only a reflection the sun’s light. John who wrote the Revelation says this: “And I saw a new heaven and a new earth: for the first heaven and the first earth were passed away; and there was no more sea” (Revelation 21:1, emphasis added). When the astronauts came back from the moon they brought with them rocks from the surface of the moon that were igneous; rocks that had once been on fire. I dare say most us breeze right through the story of Creation contained in Chapter One of Genesis without giving it much serious and prayerful thought and by doing so we miss subjects of great interest to the student of the Bible. On day two of the Creation account “Elohim made the firmament, and divided the waters which were under the firmament from the waters which were above the firmament: and it was so” (Genesis 1:7). Where are “the waters which were above the firmament” at now? They are now upon the earth and are not above the firmament anymore. “And the windows of heaven were opened. And the rain was upon the earth forty days and forty nights” (Genesis 7:11-12). What is being described in Genesis 1:6, 7 is much different than what we see now. Until the flood and right after the Creation “there went up a mist from the earth, and watered the whole face of the ground” (Genesis 2:6). It did not rain until the time of the flood. This planet went through a great transformation at the time of the flood! Let us just say that the sun was seven times brighter and hotter than it is now and the moon was as the sun for brightness and heat. Can you imagine how much hotter and brighter it would be on the planet then, if that was so, unless . . . ? I believe the water “above the firmament” surrounded the entire planet and acted as a conductor of the heat of the sun and the moon and circulated it to all parts of the globe evenly so that the climate in every part of the globe was a constant comfortable temperature 24/7, 365 days a year. It also diminished the brightness of the two heavenly bodies. There were no polar ice caps at that time! I believe Elohim meant for the entire earth to be inhabited when He created it. The account of the flood recorded in Genesis chapter 7 and 8 tells us from the “the second month, the seventeenth day of the month, the fountains of the great deep broken up, and the windows of heaven were opened” . . . “and the waters returned from off the earth continually: and after the end of the hundred and fifty days the waters were abated. And the ark rested in the seventh month, on the seventeenth day of the month” (Genesis 7:11, 8:3, 4). At the time of the flood and probably since the creation there were 30 days in each month. Today there are either 29 or 30 days in each month. There can be as many as three months with 29 or 30 days in a row but there are never 5 months with 30 days in each month. Did a shift in the axis and rotation of the moon or the earth occur at the flood? Possibly? With all that water now upon the earth, that had been above the firmament, the weight may have been unequally distributed for a time causing a shift? But we know that at the time of creation the moon was a light in and of itself and was not a reflection of the sun’s light. When the earth is made new along with the heavens, the sun will be seven times brighter than it is today and the moon will be as the sun is today for brightness. Isaiah 30:26. The New Moon Day will also be observed in the earth made new. “And it shall come to pass, that from one new moon to another, shall all flesh come to worship before Me, saith Yahuwah” (Isaiah 66:23, emphasis added). The water will be once again above the firmament as at the beginning at creation in order to shield the earth from the brightness and heat of the sun and the moon shining in all their glory! There will be no phases of the moon as there are today and has been like that since the time of the flood. There were no phases of the moon from the time of creation to the time of the flood because Elohim “made two great lights” (Genesis 1:16); not just one. The new moon is determined when the sun sets in the west and is followed by the moon rising in the east. There is only one day each month that can happen. It is the only night that moon rules the night because it is in the sky from after sunset to sunrise (Genesis 1:16). This is the way it was determined in the beginning, is the way it is determined today, and is how it will be determined when the earth and the heavens are made new. The new moon day is always determined by observation and not by any calculation, although NASA’s calculations are spot on when showing that the sun sets and the moon rises are in agreement with the observing of the sun setting in the west and the moon rising in the east. For those observing the new moon day by the first visible crescent, there was no crescent moon when Elohim first created the moon as a light; it was a light in and of itself (Genesis 1:16). The crescent moon has always been associated with the goddess Semiramis from ancient Babylon, and we are told to “Come out of her [Babylon] My people” (Revelation 18:4). It is the counterfeit that Satan invented to take away from the worship of Elohim and was used by the pagans in opposition to the full moon used by the followers of Elohim from creation until the fourth century AD when Hillel II submitted to the Emperor Constantine who fixed the Sabbath to the seventh day of the Roman calendar and abandoned the Lunar-solar Calendar of the Bible. For those using the conjunction for the new moon day I ask, how do you observe no moon and still call it the new moon? Once again I cite Genesis 1:14, 16: “Elohim said, Let there be lights [plural] in the firmament of the heavens to divide the day from the night.” He “made two great lights; the greater light to rule the day, and the lesser light to rule the night.” If there is no moon in the sky at the night when the conjunction occurs, how does the moon rule the night? Again there were no phases in the beginning until the time of the flood. The fact that the Bible states clearly that when “Elohim said, Let there be lights [plural] in the firmament of the heaven to divide the day from the night” He “made two [not one] great lights; the greater [the sun] to rule the day, and the lesser light [the moon] to rule the night” (Genesis 1:14, 16). There were no phases of the moon and there certainly was never a conjunction of the moon in the beginning at the time of creation until the flood when the moon was put out and the sun was reduced in output to one-seventh of its original strength. When Yahuwah recreates the heavens and the earth and causes the sun to be seven times brighter and the moon to be as the sun, there will once again be a full moon at all times without any phases. “Moreover the light of the moon shall be as the light of the sun, and the light of the sun shall be sevenfold, as the light of seven days” (Isaiah 30:26). My challenge to each of you; show me from the Scriptures my error, if there be any? How is the beginning of the Biblical year determined? The calendation method used in the Bible is referred to as the lunar – solar calendar. Using only the sun and the moon, we can have a consistent method in determining when the Biblical year begins. Some have chosen to use the barley harvest in Israel to be the determining factor. Let me ask you how that would have worked when Israel was out in the wilderness unable to go into the Promised Land to see how their barley harvest was coming along in order to help them to decide when the new year was to begin? Was there a barley harvest at the time of Creation? But it is clear from what is written in Genesis 1:14 that the barley harvest was not included as a determining factor. “But God said, Let there be lights in the firmament of the heaven to divide the day from the night. And let them be for signs, and for seasons [mow'ed], and for days, and years” (Genesis 1:14). Also what is written in Psalm 104:19? "He [Elohim] appointed the moon for seasons [mow'ed]." No mention of the barley harvest involved in determining the seasons is there? The calendar of the Bible begins in the spring of the year when everything comes back to life. "This month shall be unto you the beginning of months: it shall be the first month of the year to you" (Exodus 12:2, emphasis added). As mankind is regenerated when we are born again, so nature goes through a regeneration; what appears to be dead and lifeless comes alive once again. A miracle of Elohim happens right before our eyes each year and tells us of His power to recreate man who is dead in "trepasses and sin!" "And you hath He quickened, who were dead in tresspasses and sins" (Ephesians 2:1). “For the invisible things of Him from the creation of the world are clearly seen, being understood by the things that are made, even His eternal power and Godhead: so that they are without excuse” (Romans 1:20). The changes of season illustrate to mankind the “eternal power” of Elohim. Just as it takes the power of Elohim to bring life back into the works of nature, so it takes the Spirit (power) of Elohim to bring life back into mankind who are “dead in trespasses and sins” (Ephesians 2:1). In Genesis 1:14 we read that “the lights in the firmament of the heaven” were for determining among other things the “years." Psalm 104:19 tells us, "He appointed the moon for seasons [mow'ed]." The sun and moon are used in conjunction to determine the beginning of the night and the day, and the beginning of the month, and the beginning of the year. That is why it is called the lunar – solar calendar. Some have mistakenly included the stars in determining the beginning of the year just as some have included the barley harvest in Israel. It is the lunar – solar calendar and not the lunar – solar – barley harvest calendar or the lunar – solar – star calendar. When the children of Israel were leaving Egypt, Elohim told them that the month they were leaving was the beginning of the year. "This month shall be unto you the beginning of months: it shall be the first month of the year unto you" (Exodus 12:2). They left after the Passover was observed. Exodus 12:3-14. So using the sun and the moon how can we determine when the Biblical year begins? And it must be able to be observed by the naked eye? The spring equinox is what is used to determine when to begin the new year. When the first new moon, which is determined by the full moon, occurs after the spring equinoz, it is the beginning of the new year. If the 12th month ends prior to the spring equinox then a 13th month is added (intercalated) to the previous year. During a nineteen year cycle, called the Metonic cycle, there are 7 - 13 month years and 12 - 12 month years. The years listed below in bold black and underlined are the ones containing 13 months. The ones not underlined or in bold black contain 12 months. This cycle is repeated every nineteen years. “For astronomy and calendar studies, the Metonic cycle or Enneadecaeteris (from Ancient Greek: εννεακαιδεκαετηρiς, "nineteen years") is a period of very close to 19 years that is remarkable for being nearly a common multiple of the solar year and the synodic (lunar) month. The Greek astronomer Meton of Athens (fifth century BC) observed that a period of 19 years is almost exactly equal to 235 synodic months and, rounded to full days, counts 6,940 days. The difference between the two periods (of 19 years and 235 synodic months) is only a few hours, depending on the definition of the year. Let me just add this for those contemplating and for those who are observing the new moon by the first visible crescent (fvc). The first visible crescent is observed by the Moslems and seen in the flag of many Moslem nations. The first visible crescent is also assocaited with Semiramis the ancient goddess of Babylon is also known by other names in various countries. Also when using the frist visible crescent there are two days involved depending upon which part of earth you live in. There is not one day only for the observation of the visible crescent throughout the earth. And where did the Moslems get the first visible crescent? From paganism. 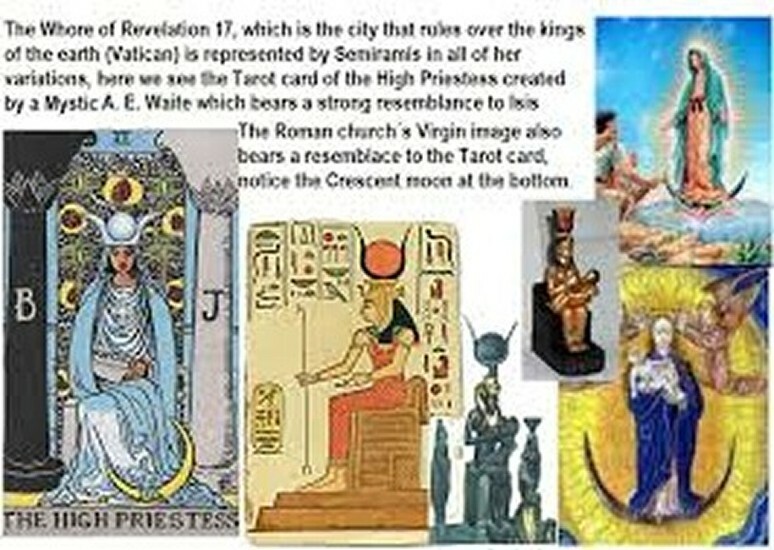 The following images represent Semiramis who was a part of the original pagan Trinity and the source of where the papacy’s false teaching of the Trinity originated. Please notice the crescent moon under her feet. There are other images with the moon on her head with the sun within it. We are called to come out of Babylon (paganism). Where the word in parentheses is (Vatican), we believe it should be (Babylon). See our study on Babylon by clicking on the shaded area. To access the current Biblical Calendar click here.